Completed just weeks before his death, the lectures in this volume mark a critical juncture in the career of Roland Barthes, in which he declared the intention, deeply felt, to write a novel. Unfolding over the course of two years, Barthes engaged in a unique pedagogical experiment: he combined teaching and writing to "simulate" the trial of novel-writing, exploring every step of the creative process along the way. 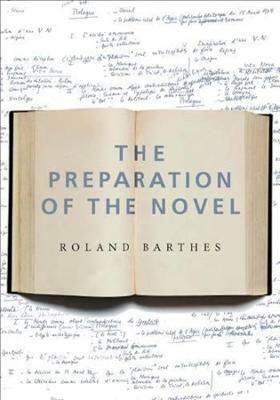 Barthes's lectures move from the desire to write to the actual decision making, planning, and material act of producing a novel. He meets the difficulty of transitioning from short, concise notations (exemplified by his favorite literary form, haiku) to longer, uninterrupted flows of narrative, and he encounters a number of setbacks. Barthes takes solace in a diverse group of writers, including Dante, whose La Vita Nuova was similarly inspired by the death of a loved one, and he turns to classical philosophy, Taoism, and the works of Francois-Rene Chateaubriand, Gustave Flaubert, Franz Kafka, and Marcel Proust. This book uniquely includes eight elliptical plans for Barthes's unwritten novel, which he titled Vita Nova, and lecture notes that sketch the critic's views on photography. Following on The Neutral: Lecture Course at the College de France (1977-1978) and a third forthcoming collection of Barthes lectures, this volume provides an intensely personal account of the labor and love of writing. Roland Barthes (1915-1980) was one of the most influential critics and philosophers of the twentieth century. His works include The Neutral, Mythologies, S/Z, A Lover's Discourse, and Camera Lucida.